This Asian Pecan Broccoli Salad is always a hit at summer barbecues and picnics. Summer has arrived and so have the invites to summer barbecues and picnics. We all know an easy dish to bring along is a healthy salad. However a salad consisting of chopped iceberg lettuce with sliced cukes and fake croutons isn’t going to make the cut. Instead, bring a salad with a bit of pizzazz! My sister brought this Asian Pecan Broccoli Salad to the cottage last summer and everyone loved how it tasted! 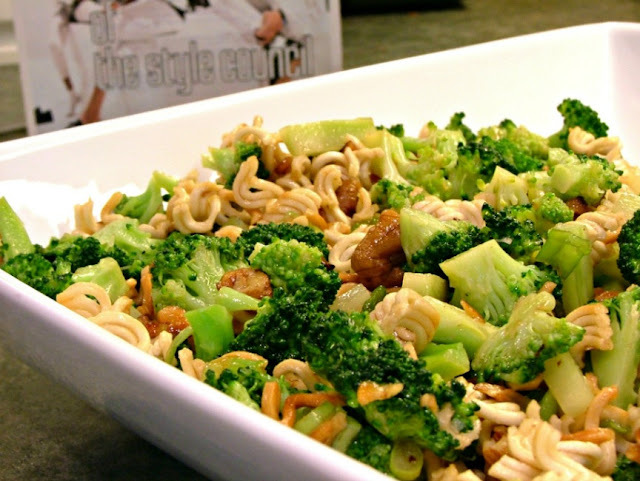 It looks interesting, and the lightly toasted noodles taste great with the broccoli, pecans and the flavorful Asian-inspired salad dressing. It's a salad made for summer! So is the song I heard when I was preparing it, Long Hot Summer by The Style Council. Every Sunday I send out updates to keep subscribers posted about new recipes I've tried or added to the Cookapalooza blog. I also include cooking techniques to ensure you enjoy what you prepare rather than wonder what went wrong. As a thank-you, you get Eight Summer Salad Recipes from The Cook-a-Palooza Experience Cookbook when you subscribe. The updates are free, signing up is easy, and you have the option to unsubscribe at any time - with no hard feelings. I invite you to see what you think. Click here to get started. In a large pot, boil the chopped broccoli in water for 1 minute. Then transfer it immediately to a bowl of ice water to stop it from cooking (this gives it a dark green color). Drain and pat dry with paper towels or use your salad spinner to remove any excess water. In a bowl combine chopped broccoli and green onions. Set aside. In a medium skillet, heat oil over medium-low heat. Add crushed noodles. Cook and stir until noodles begin to brown. Remove from heat and let cool. To make dressing, in a small bowl whisk together sugar, vinegar, soy sauce, olive oil, mustard and sesame oil. 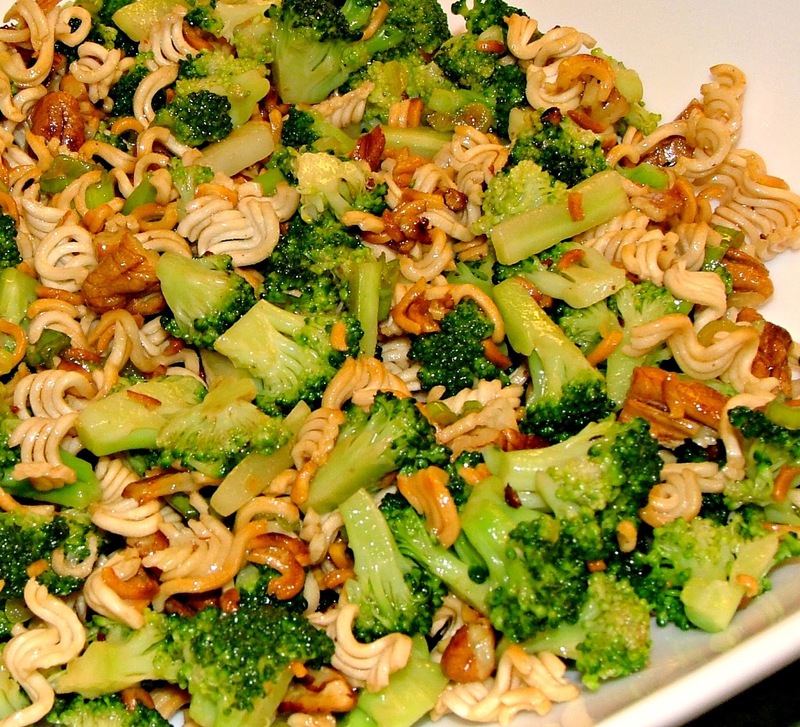 Add browned noodles, dressing, pecans and red pepper flakes to broccoli mixture. Toss until coated. I am not such a big fan of broccoli, but the salad looks very good. And I like all the other ingredients, so maybe I will give it a try! Thanks Anka! - Cauliflower or Chinese Broccoli (not as bitter) might work as good substitutes.